Microsoft is now rolling out Groove update 3.6.2244.0 for insiders. The update is available on PC, Phone, and HoloLens to the Windows Store. Currently, only Fast Ring Insiders are getting this update. We are pleased to introduce Your Groove, the place for music that is centered around you. This is where you can not only quickly get back to things you’ve played recently, but also find recommendations for what to play next. Playlists for you are automatically generated playlists curated to your taste, based on a variety of factors such as your use of Groove (e.g. top plays, recent adds), musical metadata (e.g. mood, genre, era), information about the world of music around you (e.g. recent releases, who is on tour, critical reception), and common music-related activities (e.g. focusing at work, getting a party started) They update often to give you fresh recommendations, so save the ones you love to your own playlists so you can listen to them again and again. Saving a copy also gives you the ability to edit the content and download them for offline playback. The more music you add to your collection, the higher quality and variety of Playlists for you we will be able to generate. For those with a Music Pass, we mix in some recommendations of new songs you may like based on what you already have in your collection. Files opened in Groove from other applications (e.g. email) now continue playing in the background. The app now skips queuing up unplayable tracks when playing album/artist so your now playing queue is clean and tidy. Fixed the keyboard shortcut to support ESC to exit full screen now playing. Addressed a perf issue when playing a large playlist. We now attempt to recover from situations where playback appears “stuck”. Added even more telemetry around playback as we continue to improve quality. 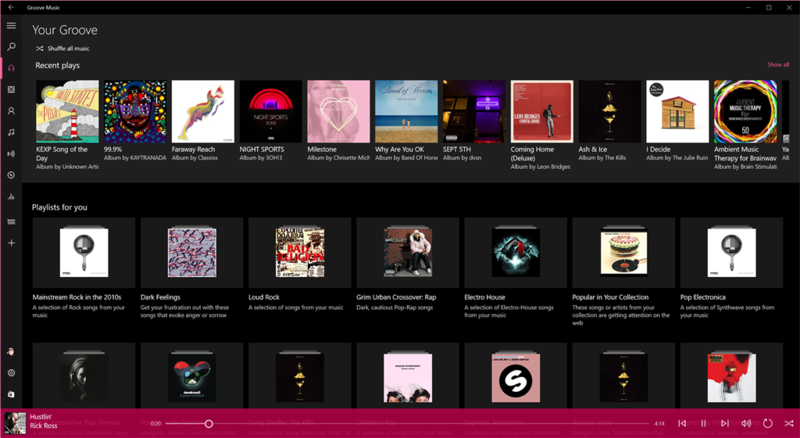 Made some changes to improve the playback reliability for Groove Music Pass content in offline scenarios.